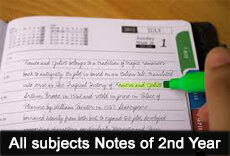 FSC 2nd year notes have a value for the students of intermediate part II. Every student is own way for preparation of exam but notes always helps students to understanding subject with ease. Internet web is hub of information and online notes of education make easy and also increase the competition in the filed of education. If you are the students of FSC and looking for intermediate notes then you are on right page. Because we are providing all notes papers of grade 11 and Grade 12(HSC). All subject notes of 2nd year class is available on this page please select a subject which notes you need. It will redirect you on specified page where you can download required 2nd year notes. Want notes of urdu punjab board !! Mje 2nd year islamic studies k notes chaheya (federal board) plz …. Please peshawar board k 2nd year k ursu comp k notes upload kr dyn..
Will you please upload The notes of Urdu 2nd year Karachi board? as soon as possible? Sir mujhy 2nd year statistics k notes chahiyen Bahawalpur board.